Bharti Airtel Limited which is commonly known as Airtel, is the largest Indian telecommunications company that operates in 20 countries with over 261 million subscribers. On 10th April 2012, Airtel launched 4G services using TD-LTE (Long Term Evolution) technology in Kolkata, becoming the first company in India to offer 4G services. Then 4G was launched in Bangalore on 7th May 2012. Now they are planning to expand their 4G services next in Pune and Chandigarh. [Update: Airtel 4G service is now available in Pune from 18th Oct 2012]. Airtel’s TD-LTE network is built and operated by ZTE in Kolkata, Huawei in Karnataka, Ericsson in Punjab and Nokia Siemens Networks in Maharashtra. Airtel paid Rs 33.1436 billion for 4G spectrum in 4 circles: Kolkata, Karnataka, Punjab & Maharashtra. 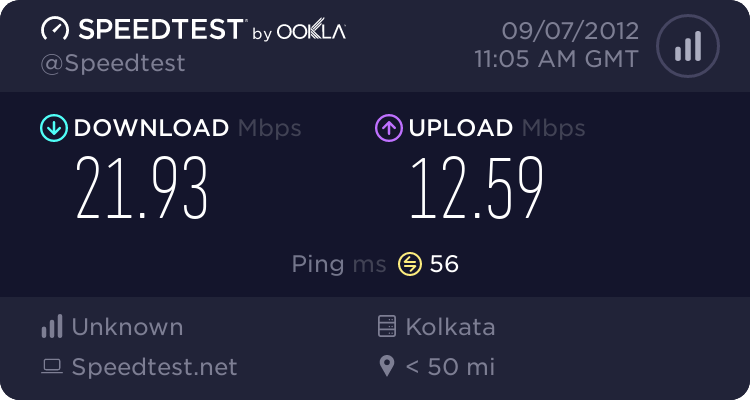 We got a chance to test Airtel 4G in Kolkata. In this article we are going to review Airtel 4G to give you a clear idea about its speed and pricing so that you decide whether you should upgrade from your existing 3G to 4G connection or not. Wireless internet access at home or your office. Access rich content and multimedia applications. Multiple downloads of heavy files & HD multimedia content. Higher upload and download speeds. Seamless online streaming – without buffering. Access business applications that require higher speeds and last mile connectivity. To use Airtel 4G you need a 4G LTE enabled device and a USIM (Universal Subscriber Identification Module) which is different from your current SIM since it is a 128 KB SIM. Currently 4G enabled mobile phones and tablets will not work in Airtel 4G network. Airtel is offering 2 types of 4G devices: 4G LTE USB dongle and 4G LTE Indoor CPE to share internet connection over Wi-Fi. Multi-mode (4G/3G/2G) data download capability. LTE network only with USIM. A USIM card slot to insert a USIM in the device. A USB 2.0 connector to connect the Airtel 4G LTE USB Modem to the laptop/PC. A Micro SD Card Slot to use the Airtel 4G LTE USB Modem as a memory stick. A self-installing Connection Manager in the Airtel 4G LTE USB Modem. Data download with unbelievably high speeds. Multiple user access and multi-screen video chat (from different locations). Built-in DHCP Server and NAT . Security serve: Comprehensive and robust security services. Intuitive and convenient web-based management. Local management and maintenance services for your gateway. All the 4G devices come with a 1 year manufacturer’s warranty. But to make 4G more attractive Airtel is proving cash back offers to new post paid customers. Airtel is taking online movie streaming to the next level by introducing Movie Catalogue of 35 movies. 10 movie titles will be available free of cost for the first month for its customers to experience the new face of entertainment over lightning fast Airtel 4G LTE without buffering, pixilation and lag. The monthly subscription for the catalogue is INR 149/month for unlimited movies. There are other value added services like Airtel Games where one can play exciting HD games on the airtel 4G LTE network with the lowest latency ever. Broadband TV, where one can watch blockbuster HD movies seamlessly with no pixelation, lag and drag. Live Devotion enables the user to watch live videos of places of worship, without even a hint of buffering or waiting. Airtel 4G review will be incomplete without doing the internet speed test. Our team was invited by Airtel to their corporate office in Kolkata and all the speed tests were performed at their 4G experience zone. In this section we will elaborately present to you about our internet experience at their office. The maximum download speed was around 23 Mbps & Upload Speed was 12.5 Mbps and the ping was also very less. While using Internet Download Manager (IDM) to download some files , the maximum transfer rate was 2.8MBps and the average transfer rate was about 1.5MBps. We also tested Airtel 4G Torrent download speed, as expected it was also very good. While downloading from Torrent the maximum transfer rate was 2MBps and the average transfer rate was about 1.2MBps. Watching YouTube videos on 4G connection was a pleasure, Full HD 1080p videos play without any buffering. The graphics heavy web pages also load very fast. Thus our tests include the main avenues that any internet user looks for. All these tests are demonstrated in the video below. Speed of wireless internet connection depends on various factors like distance from nearby base station, number of users, signal strength, etc. So, as any other wireless connection, the speed of Airtel 4G was fluctuating when the number of active users were increasing. Sometime speed of Airtel 4G was dropping to 6 Mbps from 23Mbps. The signal strength was maximum at the Airtel experience zone so we got the best test result possible. However, the speed may vary from place to place. The speed test results were quite impressive but on the other hand the price of 4G device & its rental is very high & beyond the reach of many. So should you upgrade to Airtel 4G? Yes, only if you need a super fast internet connection and ready to pay huge bills. Otherwise you can use your 3G connection until 4G devices and tariff become more affordable. In a nutshell, Airtel 4G is undoubtedly India’s fastest wireless ISP (Internet Service Provider) but it may burn a hole in your pocket. Are you using Airtel 4G connection? Please share your experience with us. Thanks for this information about Air tel 4g services . I am waiting for this to enjoy it This technology rides on LTE platform and in the world of mobile data transfer. Theoretical data down link speeds can go up to 100 Mbps. thanks for Air tel for launching this in India . is it really giving such a higher downloading speed? please do reply. Yes we really did experience such high speed. The demonstrations shown above in the videos & snapshot are all real. The signal strength was maximum at the Airtel experience zone so we got the best test result possible. Speed of wireless internet connection depends on various factors like distance from nearby base station, number of users, signal strength etc. So the speed may vary from place to place. How are the speeds in EM Byepass area? what is the average speed of 128kbps, if i m using airtel 4g.? According to the plan u select, post free usage the speed drops to 128kbps theoritically which is very slow. Now, the speed in real life will surely be less than 128kbps (may fluctuate between 100-128kbps) which is quite slow, specially when it is coming down from 4G speed. airtel 4G is no 1 fraud business in bangalore. pathetic speed and lot of disconnection. I have been using the service from the month it was launched. I have taken a Wifi LTE device and the signal bar from day 1 never crossed three and I cannot use the device on 1st floor as there is no signal reception. I was told by Airtel that initial signal calibration was in process and this will get rectified in a month or two. It did not until now. The impact is that I never get a download speed that you have provided in the article – max download is 14~15 mbps. And I cannot use it in my 1st floor rooms. Last but not the least, for last 10 days, the signal bar has been reduced to 1-2 bars !! speed has gone down drastically – I have lodged a complaint – yet no response until now!! Pathetic service !! Did you take demo before taking connection. I am in process of getting atirel 4G. Thew demo showed around 20MB speed. Hi Saket, we didn’t get enough time to test online gaming on Airtel 4G. The ping is pretty good considering it is a wireless connection. You should not face any problem with 4G. I am a user of this 4g service of Airtel. Actually the 4g speed fluctuates a lot. No one can gauge the speed at any time. I think this is pretty pity from the Airtel company that never provides the actual speed which company speaks about. i had airtel 4g connection,just few days ago (2 weeks)i disconnected it. i was using it for last 10 months. it was disconnecting automatically after 10-20mins from very begining.i called customer care they told me do this ,that but my problem remains the same.i stay just beside south city shopping mall ,kolkata here strength is excellent but why this type of problem occured.no dout speed is excellent but this problem compelled me to deactivate the connection.